Newport, RI – Loren Hope, a Rhode Island-based jewelry company featuring seasonal and timeless jewelry exclusively handcrafted in the United States, will be opening their first brick and mortar location in Newport in Spring 2019. Founded in 2005, by artist Loren Barham, also Creative Director, Loren Hope offers contemporary jewelry inspired by her lifelong passion for art, history, and travel. 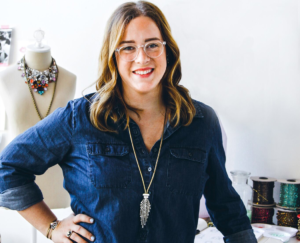 “I relocated to Rhode Island almost 6 years ago, moving my dining room table, tiny jewelry operation to the jewelry capital of the world, chasing a dream,” says Barham. Their first storefront, located at 86 William Street, will offer shoppers limited edition and one of a kind pieces, selection of bridal jewelry, and bespoke services. Rib & Rhein was the most recent occupant of 86 William Street. Classes and workshops will also be offered in the store for friends, family, business, or celebrations of any kind. “After years of hard work and persistence, we will now have a space open to the public to share our work and ideas while celebrating our made in Rhode Island heritage,” says Barnham. Loren Hope does not have a set open date, but plan for Spring 2019. For more information on Loren Hope and the opening of their Spring 2019 store, visit www.lorenhope.com.